You are here: Home / General Crafts / Bath and Beauty / Mermaid Bath Bombs That Look AMAZING Two Ways! 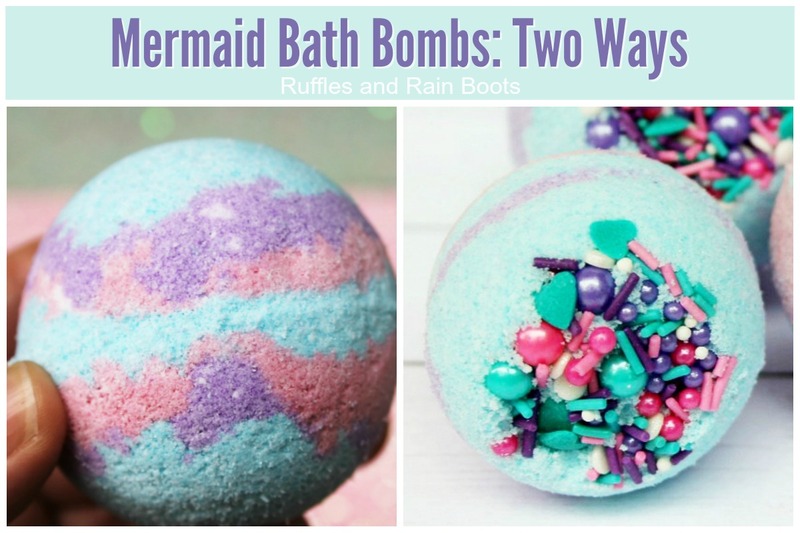 Mermaid Bath Bombs That Look AMAZING Two Ways! 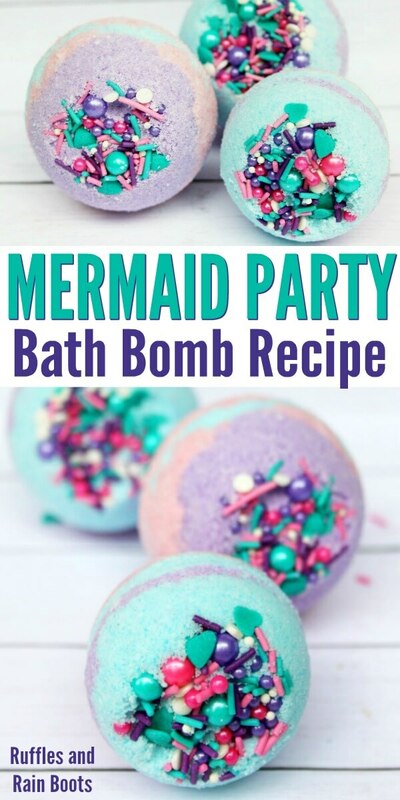 These mermaid bath bombs look amazing, smell amazing, and can be made two ways. We’re sharing all the details, so let’s get started. Here at Ruffles and Rain Boots, we are HUGE fans of making our own bath products. 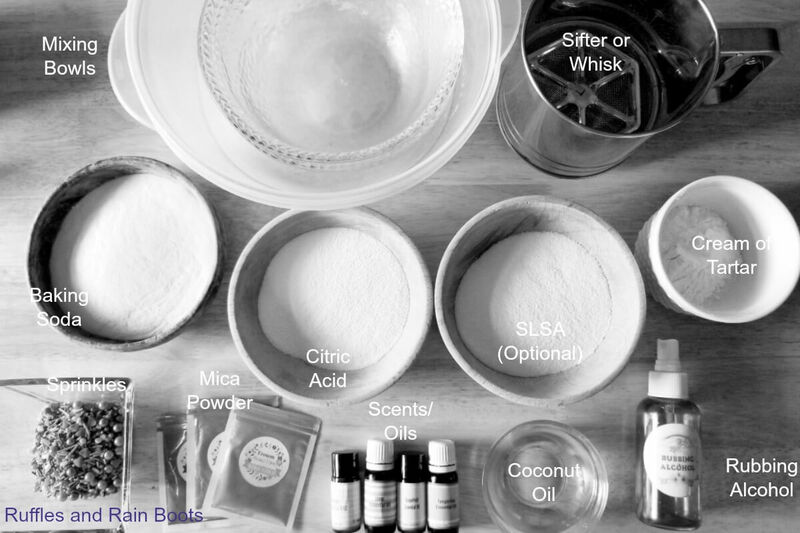 From bath bombs to shower fizzies, we are keeping our DIY bath products fully stocked. As I mentioned here in this article about the difference between bath bombs and shower fizzies, there are a few differences when you turn a bath bomb into a shower fizzy. 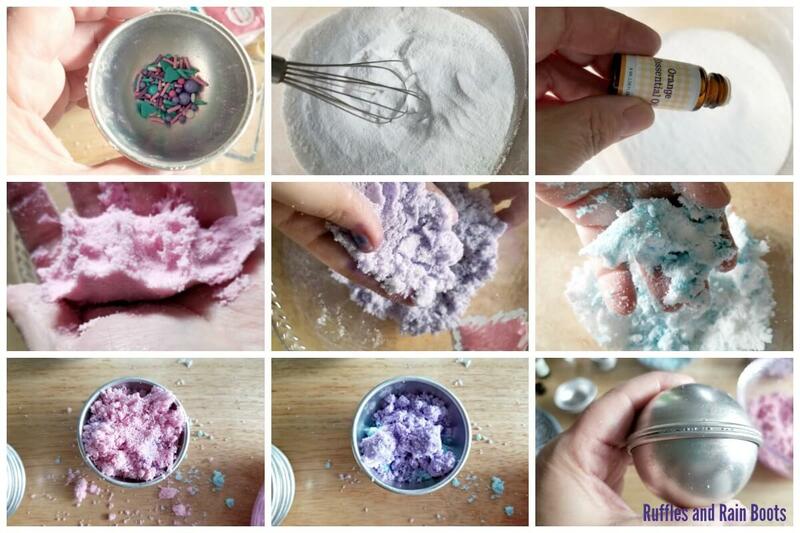 Read that if you want to alter these to become mermaid shower fizzies or shower bombs. 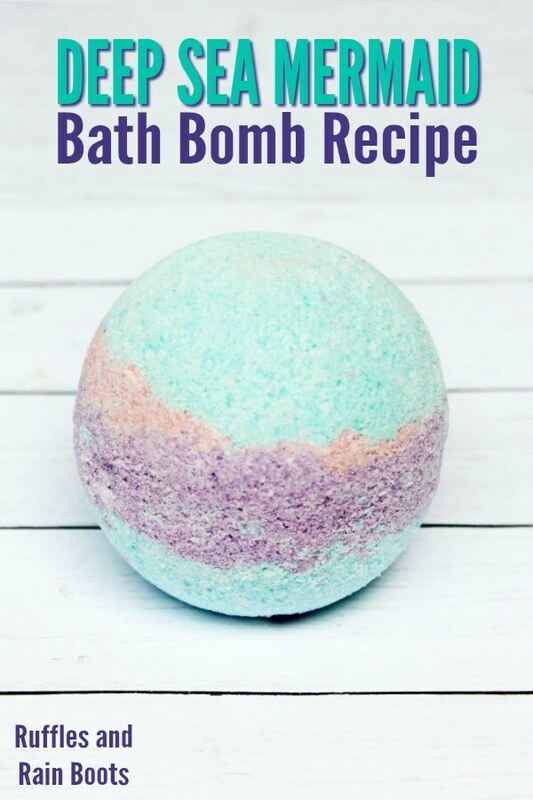 Below, I’ll share another variation on this same recipe but it’s not to turn it into a shower bomb. For that, read this article for a few shower fizzy recipe adjustments (scroll to mid-page). RELATED READING: Lemon Vanilla Bath Bombs That’ll Knock Their Socks Off! 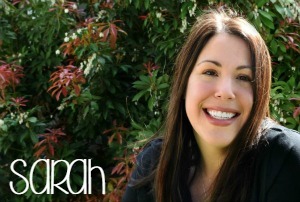 As mentioned above, we love making our own bath products. Grab a mixing bowl, 3 small bowls, a sifter or whisk, and a set of bath bomb molds. Check out our buying list on Amazon and pick and choose all of the best-tested products. Here’s a pro tip: if you don’t want one side of your bomb to be flat, spread out a kitchen towel over a muffin tin. Use this to dry the bath bombs without an indentation. Be sure to flip them around to let all areas dry. 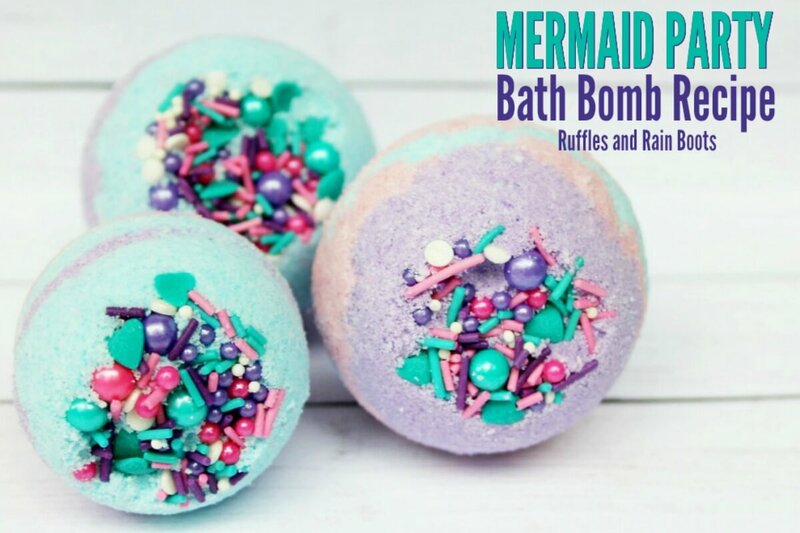 These mermaid bath bombs look amazing, smell amazing, and can be made two ways. In a large bowl, mix together the baking soda, citric acid, and cream of tartar. Whisk or sift the mixture together, removing any clumps. Add the essential oils you’ve chosen and stir to combine. Add the coconut oil and 2 tablespoons of rubbing alcohol and stir slowly. Slowly add these wet ingredients into the large bowl with the dry ingredients, about 1 tablespoon at a time to avoid activating the dry mix. The mix is ready when you can squish it together in your palm, drop it into bowl, and it doesn’t come apart. It should feel like moist sand. Separate the mix into three bowls. Add mica powder to each bowl to color the mixes and blend it together with your hands. Use gloves if you have sensitive skin and remove all rings. If making the sprinkle version of these mermaid bath bombs, load sprinkles into the bottom of a bath bomb mold half. Layer the colors and press down. Repeat with the other half of the mold, but exclude the sprinkles and overpack it slightly (a mound). You might need to spritz your mix with the spray bottle if it got a bit dry while you were mixing. Press the mold together tightly. Lightly twist to get the mold compressed. Gently tap the mold to release one side and then the other. Use the muffin tin and kitchen towel to let them dry overnight or 36 hours if heat-shrinking. If you are gifting these fun bath bombs for kids, you can leave off the sprinkles. That way, they won’t be tempted to snack on them. Additionally, when I make bath bombs for my daughter who has sensitive skin, I leave off the SLSA. It’s just a personal choice. If you’re not familiar with SLSA, it’s just an additive which helps give more fizzy bubbles to the bath bombs. It’s 100% optional. 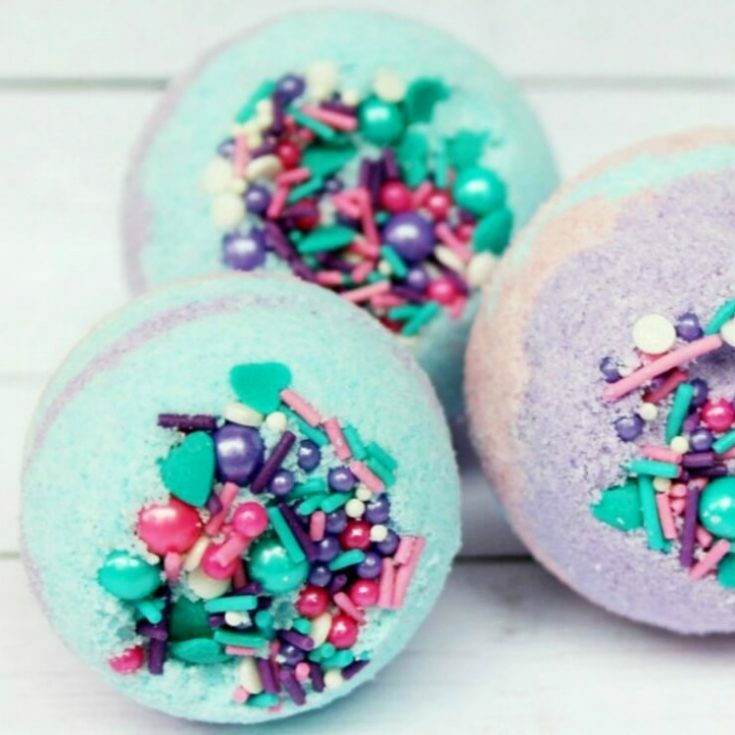 Either way, these mermaid bath bombs are absolutely stunning without the sprinkles. If you’re going to make these into shower bombs, it’s easy. Leave off the SLSA (if you have it) and put the mixture into a mold with a flat side. All of our recipes can be made into aromatherapy shower bombs easily. Unlike shower melts, these will last for a while and release a powerful punch of invigorating and energizing scents. Which way will you whip up a batch of these mermaid bath bombs? They’re great both ways but I really like the effect of the sprinkles. If you’re going to gift them, you could make a couple with the sprinkles and the rest without like we did.